← Food: What’s it Worth? I hear it all the time — people say it to me, it’s all over message boards and email threads, it’s woven into the dialogue of almost every parent who has small children. “I don’t want to raise picky eaters.” Let’s face it: with very few exceptions, none of us really WANT to be that mom who shrugs sheepishly at the family gathering and pulls out the brown-bagged sandwich for her kid while every other person at the table is at least managing to eat SOME of what’s been set before them. Nobody wants to worry that their kid will be the one at the slumber party who peels the cheese off the pizza, scrapes the icing off their cake, and rises the next morning to frown at the cereal choices offered by their host. Food is, well, a major part of life, and we want our kids — at least to some reasonable degree — to live it. I’ve optimistically titled this post “How Not to Raise a ‘Picky’ Eater,” which is probably fairly audacious. The jury, after all, is still out on how my kids’ eating habits will eventually turn out — and since one of them, at least, would still rather eat playground surfacing than pasta, I’d say there are no foregone conclusions. However, I’m not worried about it. Not because I think I’ve got a magical solution; not because I think I’m doing everything right; not because I trust that someday they will both eat every item served to them without the slightest hesitation. No, I’m not worried because I don’t believe that worrying about it will do anything other than actually create a self-fulfiling prophecy. I don’t believe in using the word “picky” to describe children’s eating habits. It’s just not natural to try to label somebody who doesn’t even have the emotional and biological equipment necessary to HAVE a defined and everlasting pattern of eating. Any adult reading this knows that “tastes change,” as my mother always used to remind me whenever she served asparagus or brussels sprouts (and, for the record, she was right — they’re now two of my favorite vegetables). What you may hate in your childhood, you might develop a liking for in adulthood; and what you may have gravitated to as a kid, like super-sweet icing, might seem cloying and a little sickening as you mature. Few of us would say of the six-year-old who wantonly spends every cent he gets, “He’s financially irresponsible.” We’d smile at his impulsivity, talk to him about savings, and try to teach him better habits. We’d know that his values, his thoughts, his desires, and his hard-wired impulse control mechanisms would all likely mature and evolve. It’s a shame we don’t allow kids to have the same freedoms when it comes to eating. We despair that the children who don’t eat green veggies will NEVER eat green veggies, as if it were an all-or-nothing proposition that’s set in stone the moment they start solid foods. It doesn’t matter how many times history and nature prove otherwise — we insist on believing that someone who at one time has a more restricted set of accepted foods will ALWAYS be restricted. 1. Thou shalt not call thy kid “picky” or “impossible” or “finicky” or anything else negative as it refers to their food preferences. Thou mayest, upon occasion, call them bad-mannered, ill-tempered, or just plain naughty — but only at thy greatest discretion, and only when they have inserted food items into non-eating orifices, spat beverages at their siblings, or have climbed underneath the eating surface and refuse to come out. 2. Thou shalt not serve to thy small eaters only the foods that they would delight in eating. 3. Neither shalt thou serve to thy small eaters only the foods that thou knowest they struggle to consume. 4. Thou shalt not convince thyself that the little ones will languish and possibly perish of starvation in the event that they may have missed a meal (or two, or more). 5. Thou shalt not consistently offer foods prepared in only one way, as this practice convinces the small eater that he does not like the food item; in fact, he may relish the food item, but disdain the preparation of your choosing. In other words, feed your kids a mixture, consistently, of “safe” foods they prefer and “more challenging” foods they’re not yet familiar with; keep dinner table discipline to manners and behavior, not negative commentary on their food choices; and offer things in as many different dishes as you can — raw broccoli, steamed broccoli, roasted broccoli, broccoli chopped and mixed with pasta, broccoli in calzones with cheese, broccoli sauteed with garlic. They’ll learn to recognize familiar foods in unfamiliar disguises, as well as determine for themselves if the broccoli itself is the problem, or if they just don’t like the cheese sauce Auntie Sue poured on top. 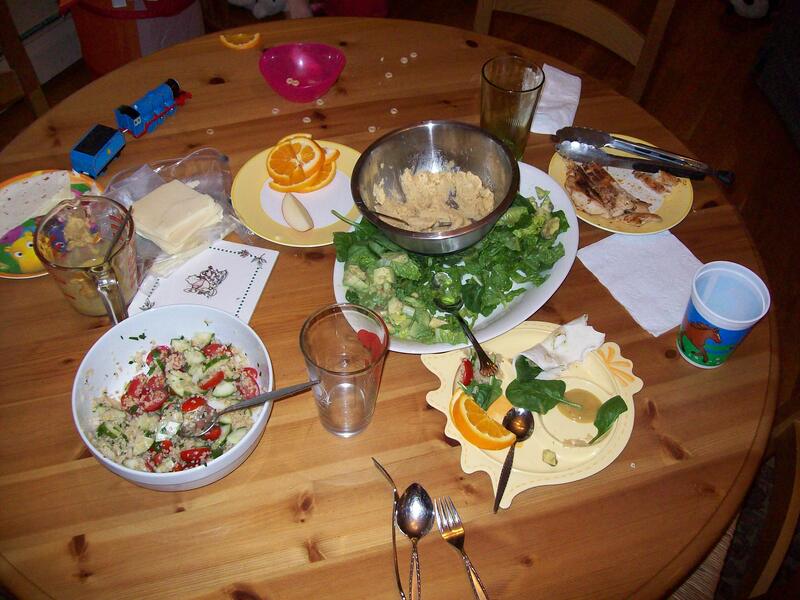 It’s not easy to follow these commandments, but it can be done; and as you progress in becoming more and more comfortable with feeding your kids adventurously (and reassuring yourself that they won’t starve to death if they don’t like the meal), one of the most fun ways to help them expand their culinary horizons is a DIY meal night. We’ve started doing these just about once a month, and they’re a big hit. I set out big platters and bowls of different healthy foods, and everyone at the table mixes and matches to make their own salads, wraps, etc. It requires a good deal of patience and humor, since the kids are apt to try one bite of something and then discard it, or try to barter with us to trade items once they’ve decided they’re not in the mood for roasted peppers tonight, thanks very much. And while it’s easy to put together one of these dinners, it can result in a bit of a mess. DIY Wrap Night: Oh, the humanity. However, great progress can be made by simply offering all these items and making a big show out of choosing different foods and creating new combinations. L. tonight ate some solid old favorites, like the Go-To Grilled Chicken, tortillas, oranges, and spinach leaves; he also decided to branch out and re-introduce himself to avocado. Once he’d dared that far, he ventured into the Tabbouleh Salad — but after a no-thank you bite, veered to the left and decided to try the homemade hummus, which he discovered he LOVED. P. took little nibbles here and there, and got down a fair amount of chicken, cheese, tortilla, and avocado; beyond that, he would take a conservative lick and grin at me. “Dee-yish-us,” he’d say, then press his now-slimy bite of food into my palm. I could stress about what they didn’t eat, or about the mess we made, or any number of things; but I choose to look at the big picture instead. They watched J. and me as we filled our plates, and L. consciously made some of the same choices I made in constructing his own dinner — proof that good modeling, while not the whole solution, does eventually pay off. P. knew that he wouldn’t be pressured into eating everything he chose to try, so he felt free to at least contemplate almost every item on the table, rather than dig in and refuse what was served on a toddler-ish whim. And in the end, I didn’t have much argument to make with what they ate. Just a few bites here and there would probably have yielded a pretty well-rounded meal. Patience, persistence, and continual presentation of interesting, healthful food. It’s not flashy, but it’s what I’ve got. Try a DIY night in your own home and see how it works for your family — does it open everyone’s minds to trying new things? Make the dinner table more relaxed? Make your cooking time easier? Come back here and let me know. I’d love to hear how you’re NOT raising picky eaters of your own. This entry was posted in Accountability, Cooking, Feeding kids, Food culture, Meal planning, Parenting and tagged cooking, family, feeding kids, food, Household organization, kids' health, meal planning, milestones, parenting, recipes, veggies. Bookmark the permalink.